22) I Am Composer. Sing and then see your music notated on a staff. 23) Monster Chorus. Monsters who sing the pitches of a scale. 24) Karaoke HD. Comes with a few free songs with the option to purchase more. 25) Songify. Records your speaking voice and then auto-tunes it into an instant song. 26) Sing Along Christmas Carols Free. Words appear on screen karaoke style. 28) Bagpipe. You have to blow on the microphone receiver to play it! 30) Ocarina 2. You also have to blow on the microphone receiver to play it. 31) WoodwindIA. The English Horn is free; you must purchase the other instruments. 33) Recorder Master. Play along with your recorder or by touching the screen. 35) Ukulele. 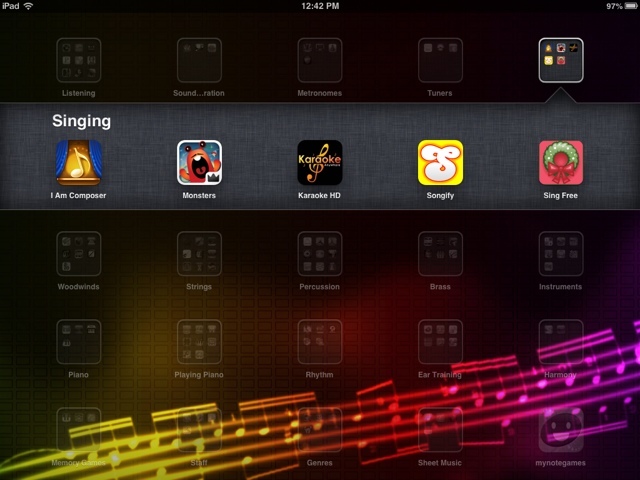 I love how you hold the iPad like a real instrument to play it. 41) WI Orchestra. This is a piano keyboard, but the violin sounds are the only ones that come free. 42) On The Music Path. Videos teaching how to play guitar and other folk strings. 50) Percussion for Kids. A mix of congas, bongos, maracas, wind chimes, and triangle. 51) Awesome Cowbell Free. A selection of 3 different sizes of cowbells. 55) Drum Man An aerial view of a drum set. 56) Bottle Music Make music with bottles or wine glasses. 58) BrassIA. The piccolo trumpet comes free; you may purchase other instruments. 64) Music Instruments by Tidels Free Flashcards with real images of musical instruments. 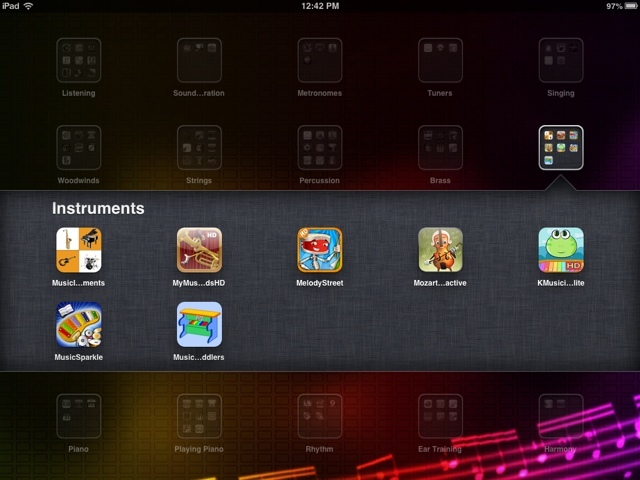 65) My Musical Friends HD Cartoon versions of the instruments to appeal to younger students. 66) Melody Street An interactive story to introduce the instruments. 67) Mozart Interactive You get to choose which instrument will play next. 68) Kids Musician A preschool app exploring percussion and keyboard instruments. 69) Music Sparkles A glockenspiel and drum set are unlocked for free. 70) Music School For Toddlers. The piano is unlocked free. I like how the note names appear above the keys. 71) MiniPiano One octave, full-size keys. 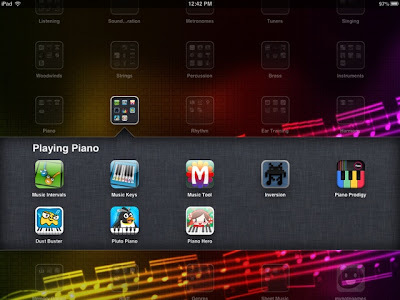 72) iPiano Lessons Instructional videos about the piano. 73) Piano Free Full 88 keys, adjustable size, with a metronome and songs. 74) Magic Piano Play beautiful piano music by touching lights as they move across the screen. 75) Music Intervals. Quizzes intervals on treble or bass clef. 76) Music Keys. Quizzes pitch names of piano keys. 77) Music Tool. Shows how to play chords on the piano keyboard. 78) Inversion Invasion A space-themed game improving chord building. 79) Piano Prodigy. Play songs from color-coded solfege. 80) Dust Buster. A game that can be used with the touch pad piano or can use the microphone to pick up the sound of a real piano or keyboard. 81) Pluto Piano. Play songs on a touch piano or by navigating a penguin up and down the staff. 82) Piano Hero. 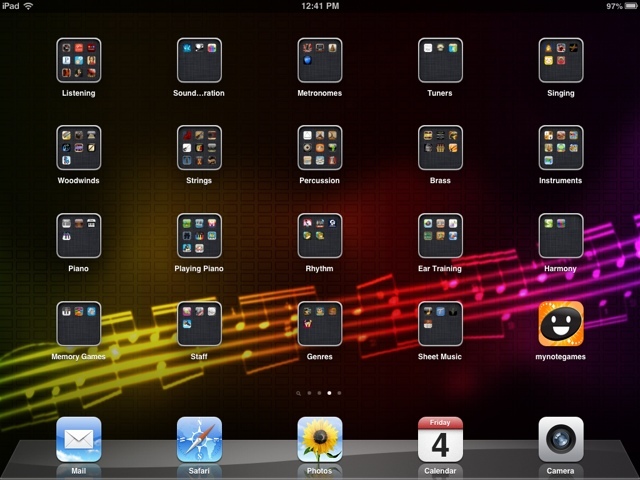 Dual player touch pianos on each side of the iPad. Play the keys as the lights approach the keys. 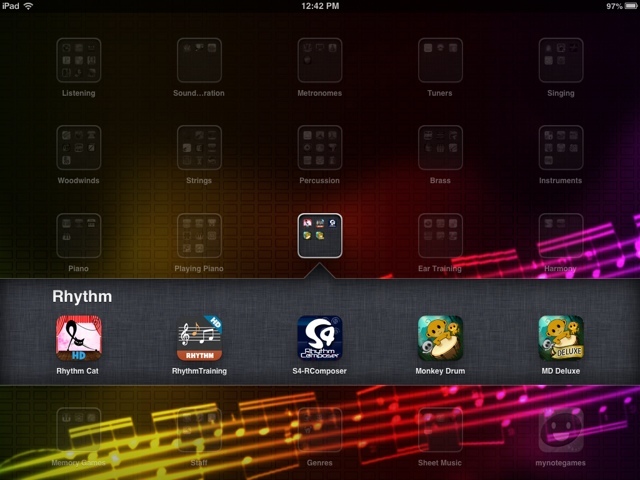 83) Rhythm Cat HD. Read rhythms and tap the screen. A previous post on Rhythm Cat can be found at this link. 84) Rhythm Training. Read rhythms and tap the screen. You may also practice at different tempi. 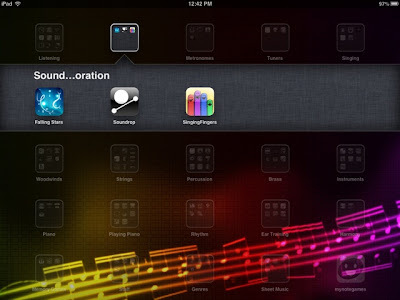 85) S4-RComposer Create beats and loops with electronic percussion sounds. 86) Monkey Drum Play rhythms and let the monkey echo you, or compose your own tunes. A previous post on Monkey Drum can be found at this link. 87) Pickup Tunes Free Ear training games recognizing intervals and scale degrees. 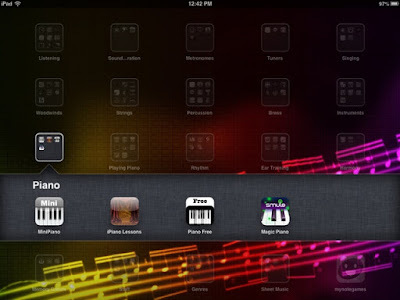 88) Nail That Note Lite Absolute, melodic, and relative pitch trainer using a piano keyboard. 89) Blob Chorus. Aural game matching pitches. A previous post on Blob Chorus can be found at this link. 90) Ear Trainer Lite. Practice aural recognition of intervals, chords, and scales. 91) Right Note Lite Ear Trainer assessing intervals, pitch, and melody. 92) Musical Puzzle HD Arrange a song by correctly ordering jigsaw pieces containing short melodic phrases and notation. 93) Sound Prism Explore harmony with lights and patterns on a grid. 94) Harmonizer Explore harmony with lights and patterned shapes. 95) Piano Game. An aural game of Simon challenging your ear training skills. 96) Rhythm Repeat Lite A memory game echoing rhythmic and melodic patterns. 97) Young Music Genius. Consists of several games. One game is memory-style flipping instrument cards over until you find a match. There is also an instrument quiz aural identifying instrument sounds and a composer quiz identifying musical excerpts by listening. 98) Note Brainer. Assess note reading flash-card style. 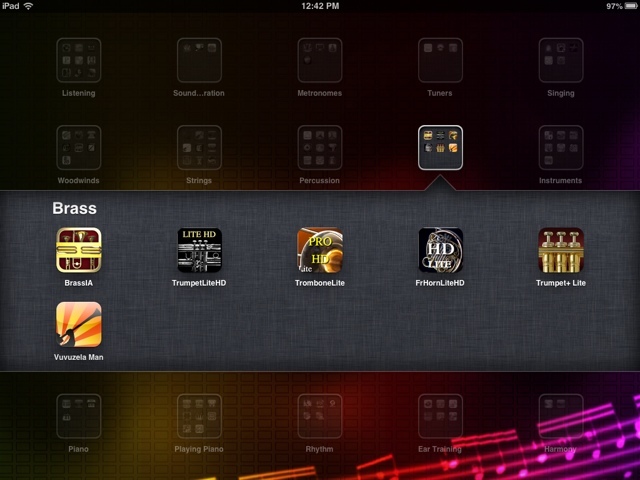 You can customize the game for treble or bass class only. 99) ClefTunes Lite Touch notes on a staff to hear the pitch. 100) Playpad. Touch lines or spaces on the staff to hear their pitch. 101) Penguin Chase. Touch a penguin and navigate him up and down a staff to play a melody, avoiding obstacles. Watch out, the tempo continues to increase! 102) Blues Cats Explore blues music by selecting which instruments you would like to hear. 103) Jazz Cats Explore jazz music by selecting which instruments you would like to hear. 104) Country Cats Explore country western music by selecting which instruments you would like to hear. 105) Spanish Sound HD Explore Spanish music by selecting sound clips. 106) Sheet Music Direct. A library of scores. Lots of music can be previewed for free or purchased through sheetmusicdirect.com. 107) Tonara Some music is offered for free. The best feature of this app is that it turns the page automatically as it hears you performing the music. 108) MusicStandPad Scan your own sheet music and store it digitally using Dropbox. This app will connects to the Dropbox library to view your music. You may write on the music to take notes and turn the page with just a flick of a finger. 109) Steinway Etude There are many free songs, but you can also purchase more sheet music. 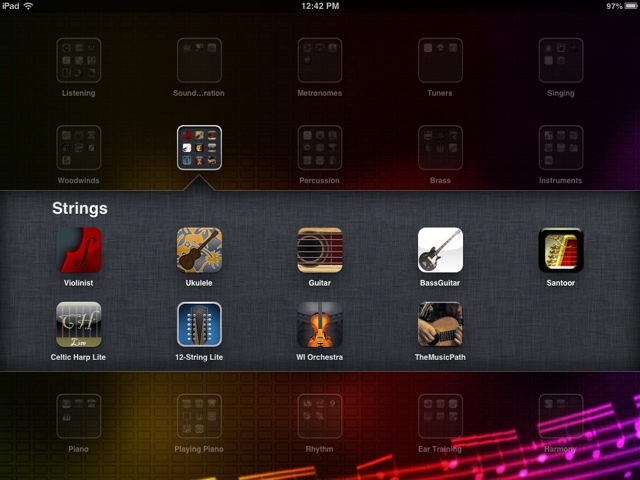 But I love the setting that shows you the strings on the inside of the piano while it plays the song selected. 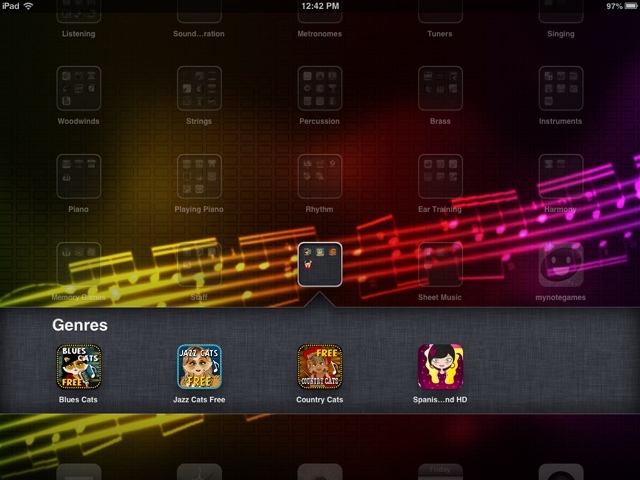 My Note Games. 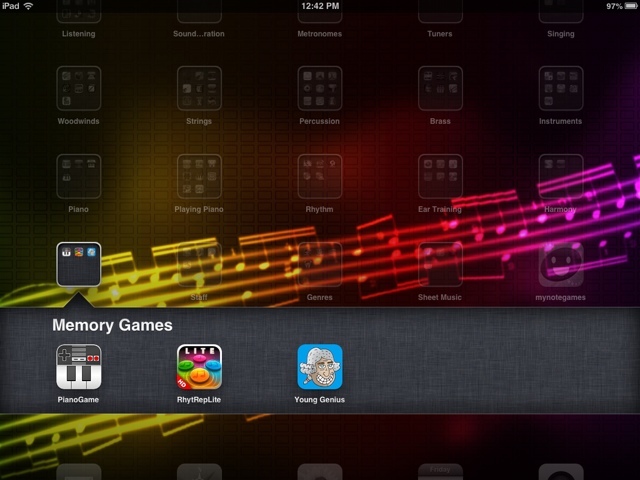 This last app is not in a folder because it could belong to many categories. 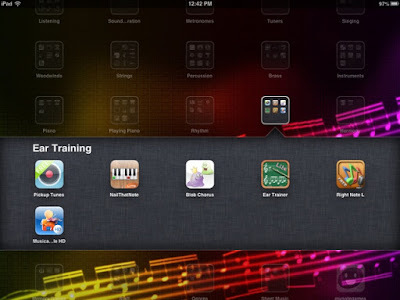 This features music theory and note reading games you can use with just your fingers on the touch screen, or with your singing voice, or any musical instrument (including recorder). If you have any other suggestions to add to this list, please comment below. Thank you so much for this list! I've been looking for some of these myself, but it's great to find them here! I also use whiteboard apps for students to draw notes and rhythms in my classroom and VidRhythm to make funny youtube-like videos. waaooo its looking great post and also i am trying to find out best music education app but nothing to get but your post really help me. join our latest whatsapp related stuff. Do you use these in your classroom? If so, for the whole class, small group, centers? I would LOVE to know how you utilize one or two specifically. Thanks! 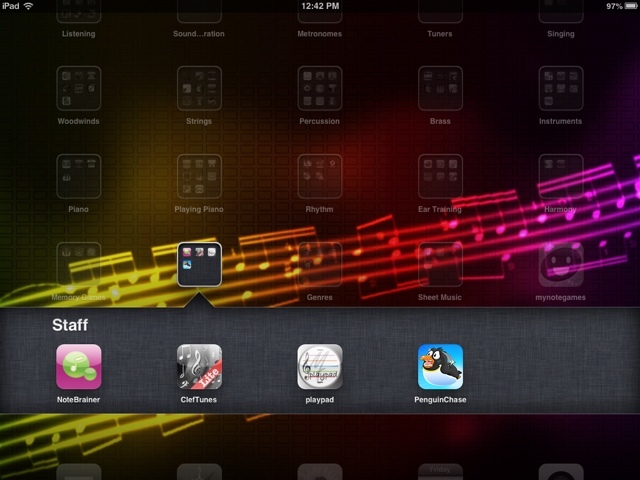 Wow this is a great list of apps. I also really like AURALBOOK. 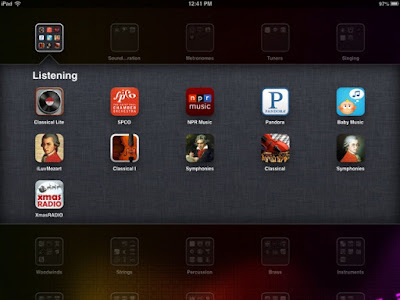 It's the only app that analyzes your listening skills and gives you tips for improvement. 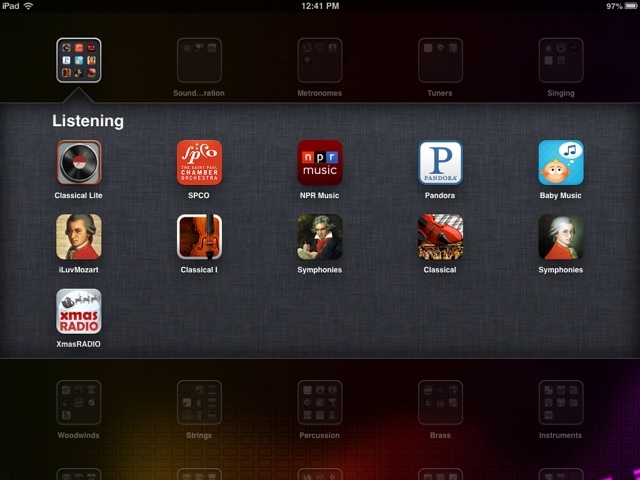 It's really a revolutionary app and I would recommend it to anyone trying to improve their listening skills. And it's free! I really appreciate this list. Thanks for the post! Very helpful and just what I was looking for! I just got to know about Jazzy World Tour, a brand new music learning app for Kids. It has a free version and interface is so user friendly. Wow Mrs. Dennis, What a fun list! I can't wait to get started. Thank you for sharing!! MusicPal is also one worth mentioning! 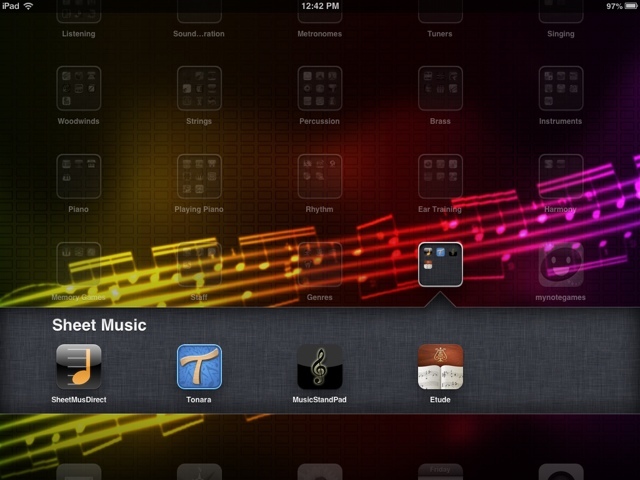 It lets you take a photo of your sheet music and instantly hear it played back. 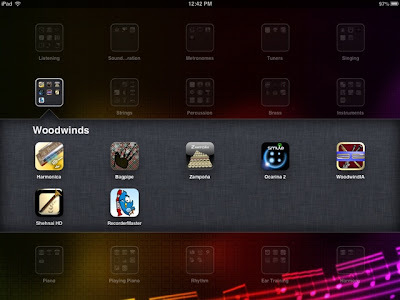 The score the app generates is totally interactive too, letting you play back certain sections, specific notes, isolate staves - an invaluable tool for anyone trying to learn to read music. This is a pretty cool app. Do you know if you can upload as a mp3? which best app for learning guitar from your education music apps ? thanks, I'll use some of these in my music classroom. Admiring the time and effort you put into your and detailed information you offer!.. 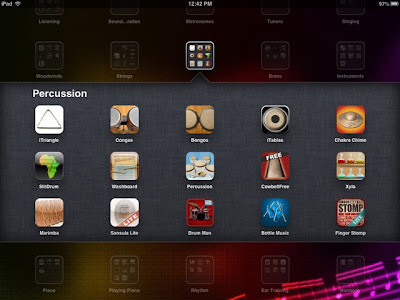 Musical app is a very nice idea to teach students.Goo going..keep it up. Really cool list of the apps! Thanks! 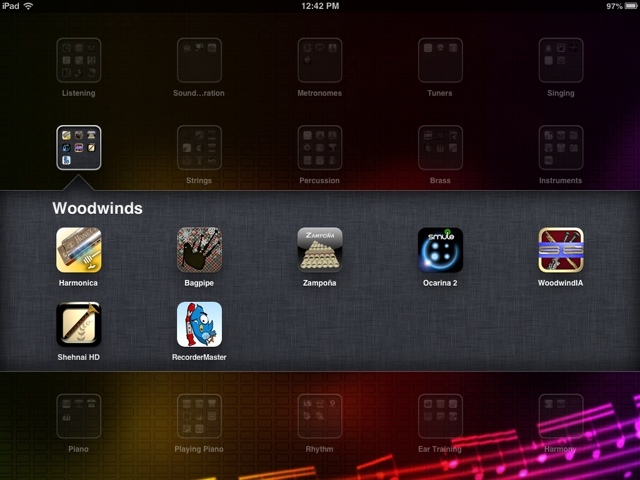 Many new apps have appeared however. I think Stave'n'Tabs deserves to be in this list. 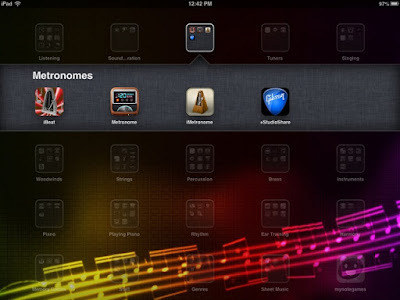 It is free iOS app for sheet music and tabs. 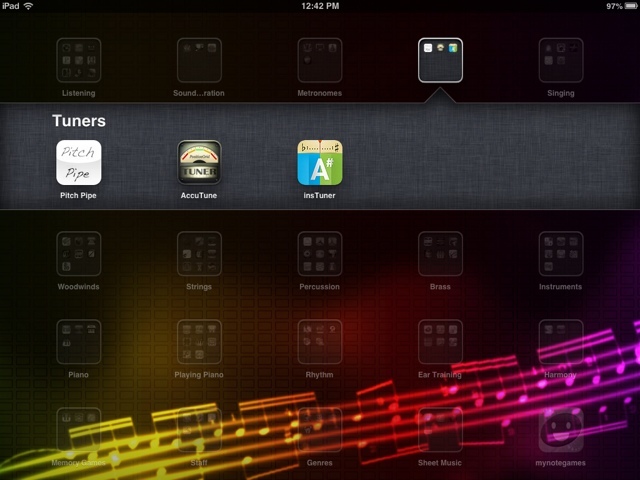 I use it to learn and practice scores for classroom. Yesterday I found new app for piano learning, but for real piano, it is Piano Master System. A bit serious but works good. vender is also very good for students! Nice blog! !Such an amazing content shared by you regarding Online Music. I like this post very much. Thanks for sharing this and keep blogging. Is homework worth the time and effort you and your children put into it? Is it worth the hassle of deciding when, where, and how to do the Dissertation Writing Services UK Is your child's homework worth giving up prime family time that you could be using to read to each other, play checkers, have a discussion, go for a walk together, or participate in creative or recreational activities? This article will answer these questions. We are the best CCTV Camera Company in Bangladesh, If you are looking for cctv cameras prices in Dhaka, then select us quote you best CCTV Camera price in Bangladesh because we are Importer, Distributor, Integrator & we are also CC Camera solution provider based in Dhaka, Bangladesh. First of all, Please allow us to introduce us, we Credible Technology is a It embed Digital security solution provider based in Dhaka, Bangladesh. We are in this business since 2002 to still continuing with full satisfaction of the valued clients. We represent renewed product from world renewed company, such as IDTECK, HANNET, NEWCOM from South Korea, 3CX PBX from UK, VCon-HD from USA (China)YHDO, Qihan, Longse, Jovision from China, Peoplelink from India. Avtech from Taiwan. Being a music lover, got some useful information. Thanks for sharing. amazing blog layout! How long have you been blogging for? Join Free Indian Whatsapp Group Links Latest 2019 you make blogging look easy. Options now contain versions for manufacturers, wholesalers, professional firms, contractors and non-profit entities. And retailers, in contributing to one precisely made for professional accounting firms who service numerous small enterprise clients. In May 2002 Intuit thrown QuickBooks Enterprise Solutions for medium-sized businesses. QuickBooks Customer Support Number here to provide tech support team to users. You provide very useful data. I think that thanks for the valuable information and insights you have so provided here.